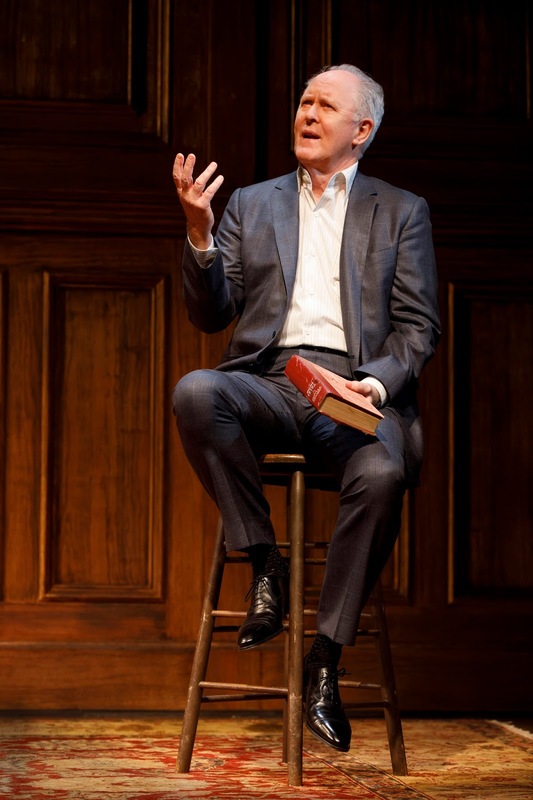 Throughout the evening, Lithgow displays the cherished tome (his only prop) -- assuring us it’s the actual family heirloom -- but when acting out the stories, he does indeed perform them from memory. Though not particularly revelatory or original, Lithgow’s family reminiscences (the other sense of the punning titular “heart”) are rather more compelling than the stories themselves, masterfully though he performs them, utilizing different voices and sound-effects (the barbershop setting of the first, for instance). He introduces the evening with some self-deprecatory remarks about the simplicity of the evening along with some standard issue setup about the power of storytelling and imagination, etc., an apology not entirely rendered unnecessary by the modest entertainment of the next two hours. Despite Lithgow’s excellence, one does need to concentrate alertly on the narratives of each story. “Haircut” -- a seemingly folksy Midwestern tale that turns subtly chilling as it progresses -- was a bit confusing in the telling, though I’ll confess I may have just been tired. Still, there were, in fact, some walkouts during the interval. By contrast, the second half -- the droll “Uncle Fred Flits By” -- was better by far, though Lithgow makes the mistake of rather overstating the hilarity of what we are about to hear in his introductory remarks. Still, the added poignancy of learning that the tale helped his ailing father rally during the latter’s decline gave some added resonance to the telling. John Lee Beatty’s simple wood-lined set with an armchair and table, Kenneth Posner’s lighting and Peter Fitzgerald’s sound design contribute to a warmly intimate ambience that sits comfortably on the American Airlines Theatre stage. The evening began under the auspices of Lincoln Center Theater back in 2008. It was directed at that time by Jack O’Brien, and on this occasion, Daniel Sullivan is at the helm, guiding Lithgow through his paces, and giving as much variety to the perforce limited action as possible. All in all, “Stories By Heart” makes for a pleasantly diverting evening, and an affirmation, not that any such is needed, of Lithgow’s impressive technique and engaging persona.